A disease of celery first noticed in Michigan and Pennsylvania during the 2010 and 2011 growing seasons, and in Ontario in the 2012 growing season has now been detected in Nova Scotia's celery fields. The disease, caused by an anthracnose fungus Colletotrichum acutatum, is known as Leaf Curl, and was positively identified earlier today. 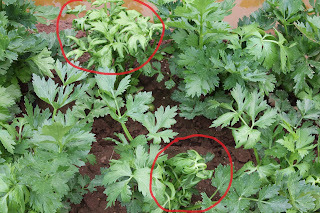 An OMAFRA vegetable blog suggests that fungicides with action against early and late blight of celery may also have action against leaf curl. For information on fungicides registered for celery in Nova Scotia see the Guide to Pest Management in Celery beginning on page 8. Michigan State University Extension has published an very informative article, Celery Anthracnose: a newly identified fungal disease of celery, which includes a number of pictures and frequently asked questions.